While the production team for NASCAR on Fox remain intact, there is one subtle but important change. The pre-race show has been rebranded "FOX NASCAR Sunday." According to a FOX spokesperson, this brings it in line with the "FOX NFL Sunday" brand. And while there were major changes in the NFL on FOX production crews, with the demotion of A-Team director Artie Kempner, the NASCAR crew has been kept intact (i.e. Kempner is still the director). 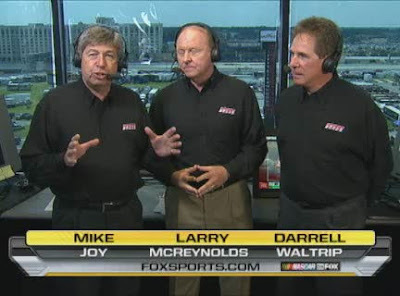 Here is the production and talent crew covering the 2010 NASCAR on FOX racing schedule.